Counties covered: Bedfordshire, Cambridgeshire, Essex, Hertfordshire, Leicestershire, Lincolnshire, London, Middlesex, Norfolk, Northamptonshire, Rutland and Suffolk. Deer species present: Red, fallow, roe, muntjac, Chinese Water Deer. A number of private collections in the region hold various other species. Key issues: High deer densities, high instances of deer-vehicle collisions, large areas of important woodland, establishing natural regeneration in woodlands, re establishing coppice cycles, productive woodfuel supply; localized high impacts to arable crops. Key features: Large number of small scattered woodlands, important areas for growing early crop roots and vegetables. 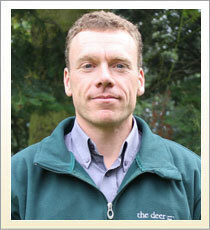 David Hooton co-ordinates the Deer Initiative’s work in East England. The East of England Deer Forum, established in 2004, brings together stakeholders in the area and has been extremely useful in co-ordinating activities and developing local priorities. The forum identified a number of challenges facing deer managers and landowners; one of these was the sale of deer carcasses, and access to local processing units and markets. A venison feasibility study led to the development of the East of England Venison Project. With the regional deer populations continuing to increase in range and number the incidence of deer-vehicle collisions (DVCs) is also increasing. Please visit What We Do » Reducing DVCs for more information on our DVC work nationally. We have worked closely with the Forestry Commission in the East of England to ensure that deer management becomes an integral part of all woodland management plans. Woodfuel East administers grants towards a wood fuel supply chain development project being run by the Forestry Commission administering funding from the Rural Development Program for England. The need to manage deer more effectively across the region has been highlighted in a number of recent reports. Strategic aims for woodfuel production, sustainable ancient woodland management, re-instatement of coppice management, reduction of deer related vehicle accidents; all require a reduction in deer numbers in many areas. The key to managing the red and fallow deer in the region is through collaborative management. A number of informal and more formal collaboration is in place throughout the region, and this has started to show good local results. The impact of growing numbers of fallow and muntjac deer in the Rockingham area remain unsustainably high and subsequent ramifications on biodiversity appear significant within declining SSSIs (Sites of Special Scientific Interest) and ASNW (Ancient Semi Natural Woodland) habitat, not to mention impact on agricultural crops. The current Rockingham Forest project area does not extend over the whole of the range of the fallow deer nor does it cover all deer impacted SSSIs in the area. The Forestry Commission (England) is one of a few major landowners across the project area referred generically as Rockingham Forest and has significant areas designated for PAWS restoration (Plantation on Ancient Woodland Sites) as well as flagged for HAP (Habitat Action Plan) and SAP (Species Action Plan) targets. It is likely that delivery of PAWS restoration targets may increase the need for deer management as well as increasing the carrying capacity of those woodlands for deer in the longer term. Major private estates in the area are now fully subscribed to collaborative culling efforts as organised by the DI/Boughton Partnership, which seeks to organise a suite of collaborative culls throughout Rockingham after the game bird season has finished. Fallow and muntjac populations continue to devastate ASNW in the locality as well as creating thousands of pounds worth of damage to agricultural crops. Through Landskills East, courses relating to the management of wild deer can be funded up to 65% of course cost. If you spend 50% of your time employed in the rural environment in the East of England you could be eligible. Courses could include carcass handling, carcass preparation or risk and liabilities for deer managers. Days will also be organised to help landowners identify the challenges associated with an increasing deer population and their impacts on woodlands and crops. Established during 2004 and meeting twice a year, the forum is currently chaired by the Deer Initiative and made up from 22 organisations in the region with an interest in wild deer management (see the list below). The broad aims of the forum are to promote the continued sustainable management of wild deer in the region, to provide a central focus point for the dissemination of information throughout the group and beyond and to identify future management priorities, research and funding opportunities. Venison marketing: To establish the means for venison to become more widely available throughout the region and for locally culled deer to be sold as venison within the local area. The East of England Venison Project has been established with a steering group formed from partners of the Deer Forum. Research: Ongoing projects involving University of East Anglia looking at landscape deer management interactions, impacts and dispersal and red deer calf tagging with monitoring from two sites in east England to establish movement patterns and migration routes. Media and publicity: The promotion of positive deer management through television, newspapers and local radio. A leaflet ‘Deer in the East of England’ has been produced to provide background information to the general public at local and regional shows and events. These are available for download or from David Hooton at the address shown above. Deer management: Identifying challenges faced by stalkers, working with other organisations to consider how deer management can become more effective, information about grants for deer management. We have successfully negotiated a range of payments with FC in the east for assistance with, for example, highseats, deer glades and more recently help towards stalker time. Members of the East England Deer Forum include BASC, Forest Research Country Landowners Association, Natural England, The Deer Initiative, The Anglian Woodland Project, National Trust, National Farmers Union, Farming Wildlife Advisory Group, The Woodland Trust, RSPCA, The Royal Society of Wildlife Trusts, British Trust for Ornithology, Royal Society for the Protection of Birds, Forestry Commission and ConFor. In March 2010, David Hooton and the East of England Deer Forum were successful in their bid to The East of England Development Agency for funding of the East of England Wild Venison Project (WVP). In partnership with The Forestry Commission (FC), and with administrative support provided by Wood Fuel East, the aims of the project were to improve and stimulate the supply of wild venison to local markets; improve wild deer management and hence also improve the Woodland SSSI status in the region. Reducing the number of Deer Vehicle Collisions and supporting landowners by better management of deer populations are additional outcomes. A Steering Group was set up to provide support and guidance to the Project Officer and the Appraisal Officer. Members of this group included representatives of BASC, BDS, and RDPE. The Steering Group operated in parallel with an Approvals Panel, which considered and approved applications for funding. Successful applications for WVP grant funding had to demonstrate that they would contribute to the aims and outcomes of the project. In assessing applications, the Approvals Panel took into account evidence of value for money and additionality (for example, a new activity or an improvement to a current activity). Just over £580,000 of funding from the Rural Development Programme under Measure 123 to add value to agricultural and forestry products was delivered by the project from March 2010 to the end of 2013. This was made up of a capital grant to support applications, and a revenue element to cover administrative costs, including the salary of a Project Officer. In addition, FC hosted the project at Santon Downham in Norfolk, contributing £15,000 per annum to cover costs which were not otherwise eligible for EU funding. High volumes of traffic and deer numbers mean that the East of England suffers from a high incidence of deer-vehicle collisions (DVCs), and has a number of the country’s worst DVC hotspots. A joint projects with Suffolk County Council (since 2004) identified two project areas where mitigation techniques including raising driver awareness could be trialled. 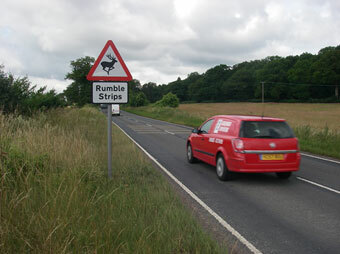 Both of these were located near Bury St Edmunds and included sections of rumble-strips and increased signage to raise awareness through these hotspot areas. Further projects with the Highways Agency’s managing agents for the trunk road network in the East surveyed known accident sites that involved deer. This type of project is ongoing and we will wherever possible be working with the main agencies and local landowners to monitor and provide advice on the issue of deer related traffic accidents. Rumble-strip project in Suffolk (photo: D Hooton). Trials of various reflectors and interactive signage have taken place in conjunction with The Three Counties Road Safety Partnership and The National Trust at Ashridge in Hertfordshire, one of the worst hotspots in the UK. Woodfuel East is a project to provide grant support to the wood fuel supply chain. It is run by the Forestry Commission in the East of England working to deliver a sustainable woodland infrastructure in line with government targets. In particular, the Government’s Woodfuel Strategy for England tasks the Forestry Commission with bringing an additional 2 million tonnes of timber to market pa in the form of woodfuel by 2020, saving 400,000 tonnes of carbon and supplying the equivalent of 250,000 homes with energy. The initial target in the East of England is for 110,000 tonnes pa by 2013 rising to 200,000 pa by 2020 leading to savings of 40,000 tonnes of carbon per year and supplying the equivalent of 25,000 homes with energy. It is estimated that this will bring an additional 50,000 hectares of woodland into productive management. If this target is to be reached and, more importantly, if production is to be sustainable it is essential that woodland, once thinned, felled or coppiced, is able to regenerate successfully. Current wild deer populations are at a level where this is not possible in many areas. Together with owners and deer managers we are working with the private sector consultants to provide support advice and infrastructure to enable them to reach their own objectives. Work with Woodfuel East is ongoing to assess the levels of deer management advice and support required to ensure these targets are met.